It inflicts a feeling of security and you feel a 100% safe riding it. The HQ Samsung battery which is legit makes you feel totally safe with this purchase. And it has good spec's also, a 10.5 mph and 13 miles with such a fast recharge time. A solid purchase for anyone looking for a safe hoverboard these days! Speed, 10.5 mph is really good and with the stability and sensitivity of the board it felt so much faster. Low, The device is a bit low. This enhances the ride and gives it a more sporty feeling, but don’t ride over high obstacles. So we went on a spree and ordered a few new boards from a brand called StreetSaw. This is their master piece model and we got ours within 4 days after the order was made which is really quick. Our favorite pick however being Swedes is their 10 inch hoverboard which gives you far superior comfort and it is easier to ride on gravel, grass and that sorts of terrain. It’s called LuckySaw and it has 6.5 inch tires and a really neat futuristic design to it. It is available in many different colors so there is sure to be one that fits you. This is probably the main question that people want answered these days so we went ahead and check it out for ourselves. Everything looks and works as it should and there are the appropriate markings and tags. A valid Samsung Serial number on the battery which proves it to be authentic. They even have written a whole page about their battery and it’s safety so I think we can rest assure that this thing will not be catching fire anytime soon. While mounting we have to agree with the makers that this piece of equipment has some fantastic calibrations. Some hoverboards might be a bit hard to mount at first but this one is as stable as can be so both mounting and dismounting went smooth. The ride itself was one of the nicest and funniest we’ve had. We rode it for around 13 miles before the battery level went down to red. Luckily recharge time on the LuckySaw is half of what most hoverboards have, took about 80 minutes to fully recharge the battery. We love battery recharge times, who would want to wait for 4-6 hours to get it going again. We’ll at least we aren’t that patient. 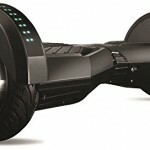 We only want the best self-balancing scooters there is and nothing else would cut just like in our top reviewed products guide. But one of the best parts is how fast and stable it is. As we said earlier this really is a solid and stable hoverboard which are built out of high quality plastics, not that cheap one most of the Gen1 models used. It has a top speed of 10.5 mph and it is waterproof IP54 rated. Blazing speed and cool design is just the top of the iceberg, it can carry 265 lbs in weight, has a maximum slope angle of 20 degrees and it comes with a fantastic manufacturer’s warranty along with their own No questions asked return Policy. This is not only a smooth ride it is a smooth deal which you can feel a 100% secure about. Over all we surely recommend the LuckySaw as one of the new safe and reliable hoverboard models. With this hoverboard you get an extensive warranty and a good return policy along with a safe Samsung battery driven hoverboard.